I love reading about classic Hollywood stars. I especially love their autobiographies, but have also read some good biographies. 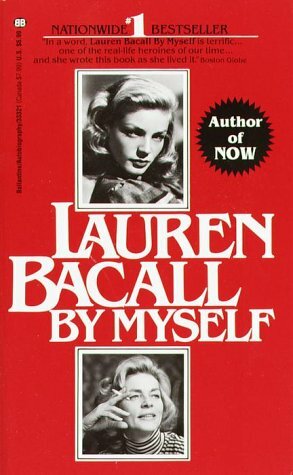 Recently, I read Lauren Bacall's first autobiography, By Myself. Biographies by people such as Lauren Bacall are interesting to me because they are their stories in, presumably, their own words. In this book, Bacall was funny and poignant. Her words seemed honest and I appreciate that. Oh, and Bogie & Bacall! I think that her romance with Humphrey Bogart was so lovely. Their wedding was idyllic, held in Ohio at a farm belonging to their friend. By Myself documents just the first part of Lauren Bacall's life. She is 87 years old presently and seems to be going strong! Amazing. What a dream it would be to meet her. *sigh* Haha, I am pretty sure that I am just spewing gibberish right now. What I am trying to say is: I loved the book. Read it, please. And while you're at it, add Katharine Hepburn's autobiography to your list.